The second Rim Space Expansion set for Firefly: The Game, Kalidasa adds a massive star system to the ‘Verse with loads of new opportunities for adventure and profit. No sector of space is safe as the long arm of the Alliance reaches out beyond the central planets with the addition of the Operative’s Corvette. Every region of the ‘Verse becomes more dangerous with the addition of new Nav Cards for Alliance Space, Border Space and Rim Space. Two new Contacts, including the twin brothers Fanty & Mingo, provide new work opportunities for ambitious crews, especially those willing to get their hands dirty. The bustling port of Beaumonde offers exciting new gear and supplies for captains of all sorts. The bounty of the Rim also flows back to other Supply Planets with new crew, gear and ship upgrades appearing on other worlds. Finally, new Set Up cards, new Story Cards and a host of surprises await the bold. The game is based on the space drama series “Firefly”, so if you are a fan you will probably enjoy all the cards, the board design and tokens. If you and your friends don’t mind spending 2 or 3 hours to play a normal game it may be right for you. But if you are a more casual gamer or don’t know the series, the game play may seem long and complex. In this case the game may seem tedious. Its stregnth: there are a lot of strategic possibilities. You can do almost anything you want. Its weakness: the game does not allows much interective between the players, so the game be boring. 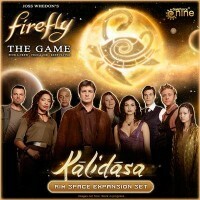 Add a Review for "Firefly: The Game – Kalidasa"